ClearSpan creates fully customizable equestrian riding arenas that are budget friendly and provide you with a place to ride year-round, regardless of the weather. The unique, ClearSpan design has no internal support posts, so riders have the maximum amount of usable space. Our equestrian arenas create an environment that both riders and horses can thrive in, and also allow you to take your riding or business to the next level. 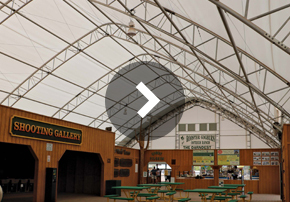 Work with ClearSpan on your riding arena to ensure you get the exact building that you’re looking for with all the equestrian accessories that you need. "The lighting is great. You really don't need to turn on any lights during the day." The Baldines needed an indoor arena that would provide a bright and peaceful riding environment, and that would also be able to endure the harsh Illinois winters. After extensive research, they decided to purchase a ClearSpan Hercules Truss Arch Building. Another aspect the Baldines liked about the ClearSpan experience was their interaction with the construction crew. “ClearSpan was very diligent in helping us understand exactly what we were getting and how the installation process would work,” explains Pete. 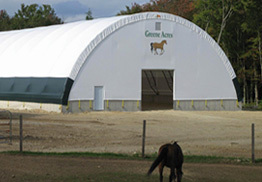 Our equine riding arenas come in fabric, hybrid and metal buildings, ensuring that no matter how you plan on using your ClearSpan structure, there is an ideal option.